In Germany, as in other countries, the Easter season is marked by traditional dishes, cakes and confectionery. Here’s a collection of recipes for the most important days of Easter week, namely Maundy Thursday (Gründonnerstag), Good Friday (Karfreitag) and Easter Sunday (Ostersonntag). Gründonnerstag is the Thursday before Easter, known as Maundy Thursday. It means “green Thursday,” although it is thought that the word “grün” is actually derived from the word “greinen” meaning to weep. However, despite there being nothing traditionally green about “green thursday”, Germans often eat green-colored foods such as herb soups. A celebration of spring herbs that’s traditionally served in Germany on Maundy Thursday (Grendonnerstag), because of it’s splendid green color. Spring soup made with fresh herbs from the meadow, garden (or market) is a special treat of the Easter holiday, traditionally eaten on Gruendonnerstag (or Maundy Thursday). Despite there being nothing traditionally green about “Green Thursday,” Germans often eat green-colored foods such as herb soups like this one featuring chervil. 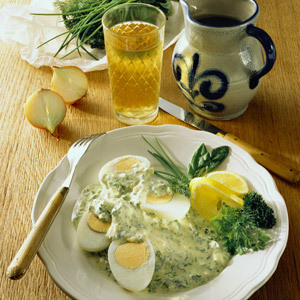 Hard boiled eggs with a green spring herb sauce, garnished with watercress. A perfect dish for Easter brunch. The Friday before Easter is known as Karfreitag (Good Friday in the US) or “Sorrowful Friday” and traditionally people eat fish for dinner with their family. Two Easter eating traditions combine in this Good Friday entree of fish cakes in green sauce. Fish and sauerkraut is a popular combination in Germany, particularly using freshwater river and lake fish. The main day of German Easter celebrations is Easter Sunday. For Christians it is a time for the whole family to get together to celebrate the resurrection and the end of the Lent with a festive meal. A more festive breakfast is often on the menu since families have more time to relax and enjoy a more leisurely brunch-type meal after the children have exhausted themselves looking for Ostereier from the Osterhase! A traditional Easter meal consists of lamb, which represents innocence and humility, accompanied by fresh vegetables and potatoes. Festive cakes are, of course, also a staple ingredient for a Easter Sunday afternoon Kaffee und Kuchen. These baked eggs with genuine Black Forest ham, Emmentaler cheese, and cress are the perfect great brunch food. Homemade brioche dough baked and decorated as colorful Easter bunnies – fun at an Easter brunch. A traditional roast leg of lamb with a juniper berry flavored gravy. A festive spiced carrot cake decorated with marzipan Easter eggs and sugar flowers, perfect for Easter Sunday dessert. This buttery brioche cake is named ‘Bee Sting’ because it’s glazed with honey right before baking.